Undocumented immigrant traffic: There was extensive evidence that undocumented immigrants use the Monument, mostly in the form of trash dumped at camps, pickup sites, and along travel routes. We also encountered several large groups of people in heavily-loaded vans, pickups, a stake-bed truck, and on foot. It is difficult to evaluate the biological damage this traffic may be causing, but the huge numbers of people passing through presumably cause significant impacts. We encountered a number of well-traveled roads that served no apparent function to ranchers or tourists. They all had in common that they provided access from the Tohono O’odham Reservation via gates or holes cut in the boundary fence. There is also a great deal of foot traffic in many washes. In fact most of the large washes in the Roskruge, Silver Bell, and West Silver Bell mountains and the Aguirre Valley had evidence of immigrant traffic (huge quantities of clothing, plastic water bottles, food containers with Spanish labels, and a few abandoned bicycles). There is so much traffic in some washes that the people may be disturbing the biota by trampling seedlings and frightening wildlife. A road recently blazed up a hillside near Ragged Top. Driving off road: Only a few of our plots were scarred by off-road vehicles and in most cases vehicles had not been far off established roads. The exceptions were associated with undocumented immigrant traffic. We found several staging areas hidden in thickets of vegetation, with tracks leading over crushed vegetation into them (and large piles of trash at the sites). Driving off-road is nonetheless a significant threat to the ecological integrity of Ironwood Forest National Monument because of the easily-damaged soils and the slow recovery rates of most damaged desert plant species (Lovich and D. Bainbridge 1999, Gillette and Adams 1983, Wilshire and Nakata 1976, Webb et al. 1978). 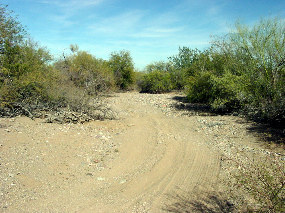 Vehicle tracks in a wash near Ragged Top that is posted against driving. See the wash gallery for more images and information. Driving in washes: Driving in washes is extensive. Most of the nonrocky washes we visited that were wide enough for an ORV had tracks, including several that were signed and barricaded. This activity inflicts serious damage to xeroriparian communities. Shrubs often establish in wash channels in between scouring floods. In wet winters the channels support dense stands of annual plants, which in turn become a major food source for many species of wildlife. In drier years when annuals do not grow elsewhere they thrive in the deeper soils of washes; at these times the foliage and seeds are particularly important for wildlife. Washes occupy a tiny percentage of the land surface of the Lower Colorado River Valley subdivision of the Sonoran Desert, but most of the biomass of plants and animals is concentrated in this habitat. In the driest areas west of IFNM up to 90% of the plant and bird life is restricted to washes (California Desert Conservation Area Plan 1980). Even light vehicle traffic severely disrupts this growth and reduces overall forage, and drastically reduces wildlife density (Luckenbach 1978, Busack and Bury 1974, Bury et al. 1977). Damage to plants (harvesting, vandalism, etc. ): We found numerous examples of saguaro cutting and one case of ocotillo cutting. In the cases of the saguaros, the plants had been cut near the ground and the skeletons were gone. Though widespread, most of the saguaro harvesting appeared to be fairly old and not common in any one area. It does not seem to be a major problem. We encountered a few examples of vandalism to plants, mostly gunshot wounds; they are most visible on saguaros. One of these sites had been vandalized only a few days before we discovered it; there were hundreds of spent shells, clay pigeons, and garbage left behind. 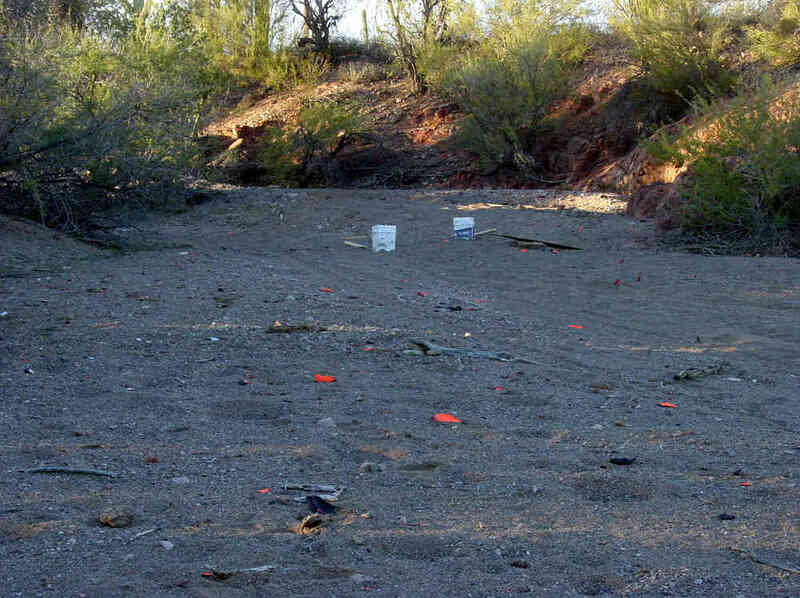 Two palo verde trees had been shattered by high-powered rifle bullets. There were several other places where trees had been cut as if for firewood. 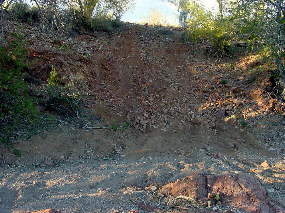 In one section of Cocío wash the cuts ranged from very recent to quite old (mesquites had regrown major limbs). This site has been harvested for many years. The cut trees were mostly mesquites, but a few were ironwoods. 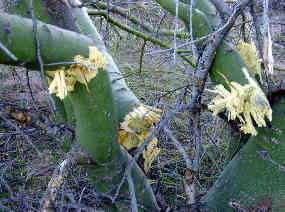 Vandalism to a palo verde from high-powered rifles. There are reports of similar vandalism to ironwood trees in the Monument. Trash left behind by target shooters. 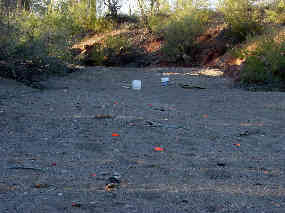 This site is a mile off the road up a wash.
Campsites: We found several campsites evidently made by tourists or hunters. The disturbance to soil and plants was minimal and there was little trash. We did not try to determine whether ironwood was used in the campfires. Burning of ironwood should not be allowed (see discussion on longevity of ironwood trees). Grazing: We observe little negative impact to vegetation from grazing except in the immediate vicinity of artificial water catchments and in some washes. There are also several places, especially near Ragged Top, where cattle shelter under large ironwood trees. These trees have barren, disturbed soil beneath their canopies. We are not range specialists, but the presence of seedling trees, saguaros, and other plants on most plots, and numerous grasses that were going to seed even during these two drought years suggest that current levels of grazing pose no threat to the general health of the ecosystem in Ironwood Forest National Monument. Two subjects need further investigation. Some washes were heavily browsed. Because of the rarity and sensitivity of xeroriparian woodlands, further study is recommended to verify that wash vegetation is maintaining viable recruitment of new plants. Large ironwood trees have dense canopies, and we have assumed that the usual absence of other plants beneath them is due to the heavy shade. But the possible influence of cattle has not been determined.